A. Trembanis, Mayer, L. A., Raineault, N. A., Schmidt, V. E., Rzhanov, Y., and Calder, B. R., “Remote Acoustic Characterization of Seafloor Properties from an AUV”, Ocean Sciences Meeting. Portland, OR, USA, 2010. K. Brumley, Miller, E. L., Mayer, L. A., Andronikov, A., Wooden, J. L., Dumitru, T. A., Elliott, B., Gehrels, G. E., and Mukasa, S. B., “Petrography and U-pb, Detrital Zircon Geochronology of Metasedimentary Strata Dredged from the Chukchi Borderland, Amerasia Basin, Arctic Ocean”, American Geophysical Union (AGU). San Francisco, CA, USA, 2010. D. Fequet, Gauthier, M. F., Ramsay, B., McLeay, C., and Alexander, L., “Sea Ice Coverage as an IHO S-57 Marine Information Overlay (MIO)”, CARIS. Miami, FL, USA, 2010. C. Lanzoni and Weber, T. C., “High Resolution Calibration of a Multibeam Echo Sounder”, IEEE Oceans. Seattle, WA, USA, 2010. L. Cocchi, Muccini, F., Carmisciano, C., Vagni, R., and Masetti, G., “Acquisizione marina dell’alto strutturale del Mt. Vercelli (Mar Tirreno Centrale) e del golfo di Napoli: descrizione dei rilievi e primi risultati”, GNGTS National Conference, vol. 3. Prato, Italy, Italy, pp. 517-518, 2010. C. Nellemann, Corcoran, E., Duarte, C. M., Valdes, L., DeYoung, C., Fonseca, L., and Grimsditch, G., “Blue Carbon: The role of healthy oceans in binding carbon”, 2010. G. Masetti, Sacile, R., and Trucco, A., “Caratterizzazione remota del fondale marinotramite analisi e mosaicatura del backscatter”, Atti 14a Conferenza ASITA. Brescia, Brescia, Italy, pp. 1275-1280, 2010. V. E. Schmidt, Raineault, N. A., Skarke, A., Trembanis, A., and Mayer, L. A., “Correction of Bathymetric Artifacts Resulting from Surface-Wave Inducted Modulations of an AUV Pressure Sensor”, University of New Hampshire (UNH), Center for Coastal and Ocean Mapping (CCOM)/Joint Hydrographic Center (JHC), 2010. T. Nada, “Geophysical seismic investigation using high resolution sub-bottom profiler in the Eastern Harbor of Alexandria, Egypt”, Egyptian Journal of Aquatic Research, vol. 36 (2). National Institute of Oceanography and Fisheries, 2010. T. Nada, “Geophysical seismic investigation using high resolution sub-bottom profiler in the Eastern Harbor of Alexandria, Egypt”, 4th International Conference on Aquatic Resources "Preservation, Protection and Development". p. Alexandria, Egypt, 2010. G. Masetti and Carnevale, L., “GIS e GeoDB: due acronimi per capire il mondo. Elementi teorici e spunti argomentativi sull'integrazione dei dati geografici”, Rivista Marittima, vol. 3. Italian Ministero Della Difesa, Rome, Rome, Italy, pp. 91-100, 2010. L. Valdes, Fonseca, L., and Tedesco, K., “Looking into the Future of Ocean Sciences: an IOC Perspective”, Oceanography Magazine, vol. 23. The Oceanography Society, pp. 160-175, 2010. A. A. Armstrong, “Multibeam mapping of the United States continental margin: Supporting the effort to delinieate the extended continental shelf under Article 76 of the United Nations Convention on the Law of the Sea”, International Hydrographic Conference. Cape Town, South Africa, 2010. C. E. Parrish, White, S. A., Calder, B. R., Pe'eri, S., and Rzhanov, Y., “New Approaches for Evaluating Lidar-Derived Shoreline”, Imaging and Applied Optics Congress. Tucson, AZ, USA, 2010. J. Beaudoin and Schmidt, V. E., “R/V Thompson EM302 SAT -- Cruise Report”, University of New Hampshire (UNH), Center for Coastal and Ocean Mapping (CCOM)/Joint Hydrographic Center (JHC), 2010. L. A. Mayer, Armstrong, A. A., Calder, B. R., and Gardner, J. V., “Seafloor Mapping In The Arctic:Support For a Potential US Extended Continental Shelf”, International Hydrographic Review, vol. 3. Geomatics Information & Trading Center - GITC, Lemmers, Amsterdam, The Netherlands, pp. 14-23, 2010. J. Muggah, Church, I., Beaudoin, J., and Hughes Clarke, J. E., “Seamless Online Distribution of Amundsen Multibeam Data”, Canadian Hydrographic Conference (CHC). Quebec City, Quebec, Canada, pp. 1-19, 2010. C. Ware, Friedlaender, A. S., and Nowacek, D. P., “Shallow and Deep Lunge Feeding of Humpback Whales in Fjords of the West Antarctic Penninsula”, Marine Mammal Science, vol. 27. Wiley, pp. 587-605, 2010. V. E. Schmidt, Weber, T. C., Wiley, D. N., and Johnson, M. P., “Underwater Tracking of Humpback Whales (Megaptera Novaeangliae) with High-Frequency Pingers and Acoustic Recording Tags”, IEEE Journal of Oceanic Engineering, vol. 35. IEEE, Washington DC, Washington DC, USA, pp. 821-836, 2010. J. V. Gardner and Calder, B. R., “U.S. Law of the Sea Cruise to Map the Southern Flank of the Kingman Reef-Palmyra Atoll section of the Line Islands, Equatorial Pacific Ocean”, Center for Coastal and Ocean Mapping / Joint Hydrographic Center, Durham, NH, 2010. J. V. Gardner, “U.S. Law of the Sea cruises to map sections of the Mariana Trench and the eastern and southern insular margins of Guam and the Northern Mariana Islands”, University of New Hampshire (UNH), Center for Coastal and Ocean Mapping (CCOM)/Joint Hydrographic Center (JHC), 2010. J. V. Gardner, “The West Mariana Ridge, Western Pacific Ocean: Geomorphology and Processes from New Multibeam Data”, Geological Society of America Bulletin (GSAB), vol. 122. The Geological Society of America (GSA), pp. 1378-1388, 2010. S. Pe'eri, Morgan, L. V., and Armstrong, A. A., “Current Research on Airborne LIDAR Bathymetry (ALB) Shoreline Mapping”, FUDOTERAM Workshop Reminder on LiDAR Bathymetric Studies. Montreal, Quebec, Canada, 2009. D. N. Wiley, Brown, M. W., Clark, C., Hatch, L., Johnson, L., Koyama, K., Merrick, R., Schwehr, K., Siber, G., Tetreault, B., and Thompson, M. A., “Minimizing Vessel Strikes to Endangered Whales: A Crash Course in Conservation Science and Policy”, Smithsonian's National Museum of Natural History. Washington DC, Washington DC, USA, 2009. Y. Rzhanov, Fonseca, L., and Mayer, L. A., “High-resolution Delineation of Acoustically Homogeneous Areas in Multibeam Backscatter Maps”, Gulf of Maine Symposium. St. Andrews, New Brunswick, Canada, 2009. H. Hecht, Berking, B., Jonas, M., and Alexander, L., The Electronic Chart: Functions, Potential and Limitations of a New Navigation System, 3rd ed., no. Adam Kerr. Lemmers, Amsterdam, The Netherlands: GeoMares Publishing, 2009, pp. 1-322. L. Alexander and Schwehr, K., “Concept: IALA AIS Binary Messages Web Site for Message Catalog and Register”, International Association of Aids to Navigation and Lighthouse Authorities (IALA-AISM). Key West, FL, USA, 2009. V. E. Schmidt, Raineault, N. A., Skarke, A., Trembanis, A., and Mayer, L. A., “Correction of Bathymetric Survey Artifacts Resulting from Apparent Wave-induced Vertical Movement of an AUV”, University of New Hampshire (UNH), Center for Coastal and Ocean Mapping (CCOM)/Joint Hydrographic Center (JHC), 2009. M. Doucet, Gee, L., Weber, T. C., Arsenault, R., Mayer, L. A., Ware, C., and Malik, M. A., “Advanced Mid-Water Tools for 4D Marine Data Fusion and Visualization”, IEEE Oceans. Biloxi, MS, USA, 2009. S. Pe'eri, Morrison, J. R., Frederick, S., Mathieson, A., and Trowbridge, P., “Macroalgae and Eelgrass Mapping in Great Bay Estuary Using AISA Hyperspectral Imagery”, Coastal Geotools. Myrtle Beach, SC, USA, pp. 110-111, 2009. S. Pe'eri, “Evaluation of Airborne LIDAR Bathymetry (ALB) in Sub Tidal Coastal Environments”, GeoTech. Silver Springs, MD, USA, 2009. M. H. Cormier, Vogt, P. R., Monahan, D., and Smith, W. H., “A Proposal to Completely Chart the World's Oceans”, National Oceanographic Partnership Program (NOPP), Ocean Research and Resources Advisory Panel (ORRAP), 2009. B. R. Calder, Brennan, R. T., Hill, R., and Lear, R., “Precise Distributed Timekeeping in Hydrographic Survey”, Systems Professional Surveyor Magazine, vol. 29. Flatdog Media Inc., Frederick, MD, USA, 2009. M. S. Boettcher, “A Synoptic Model of Slip on Mid Ocean Ridge Transform Faults - Insights from Earthquakes and Laboratory Experiments”, Marine Geoscience Leadership Symposium. Washington DC, Washington DC, USA, 2009. T. C. Lippmann, “Observations of River Topography and Flow Around Bridges”, Ohio State University , USGS Water Resources Research Institute, 2009. J. Beaudoin, Hiebert, J., Calder, B. R., and Imahori, G., “Uncertainty Wedge Analysis: Quantifying the Impact of Sparse Sound Speed Profiling Regimes on Sounding Uncertainty”, U.S. Hydrographic Conference (US HYDRO). Norfolk, VA, USA, 2009. T. C. Weber, Clark, T. J., and Wilson, C., “Simultaneous Water Column and Seafloor Mapping with the Simard ME70”, FEMME - Kongsberg (users conference). Lisbon, Lisbon, Portugal, 2009. L. Alexander, “Inland Navigation Technology '09 - Digital Technology Impact on Safety and Efficiency”, U.S. Army Engineer Research and Development Center, Coastal and Hydrologic Laboratory, 2009. J. Beaudoin, Calder, B. R., Hiebert, J., and Imahori, G., “Estimation of Sounding Uncertainty from Measurements of Water Mass Variability”, International Hydrographic Review. Geomatics Information & Trading Center - GITC, Lemmers, Amsterdam, The Netherlands, pp. 20-38, 2009. L. Alexander, “e-Navigation: Challenges and Opportunities”, U.S. Hydrographic Conference (US HYDRO). Norfolk, VA, USA, 2009. S. Pe'eri and Gardner, J. V., “Evaluation of Airborne LIDAR Bathymetry (ALB) in Sub-tidal Coastal Environments”, Joint Airborne LIDAR Bathymetry Technical Center of Expertise Coastal Mapping and Charting Workshop (JALBTCX). Portland, OR, USA, 2009. T. C. Weber, Bradley, D. L., and Lyons, A. P., “Multiple Scattering Through Clouds of Gas Bubbles in Liquids: Accounting for Clustering in the Higher-order Moments”, Acoustical Society of America (ASA). San Antonio, TX, USA, 2009. R. E. Grizzle, Ward, L. G., Mayer, L. A., Malik, M. A., Cooper, A. B., Abeels, H. A., Greene, J. K., Brodeur, M. A., and Rosenberg, A. A., “Effects of a Large Fishing Closure on Benthic Communitites in the Western Gulf of Maine: Recovery from the Effects of Gillnets and Otter Trawls”, Fisheries Bulletin, vol. 107. National Marine Fisheries Service Scientific Publications Office, pp. 308-317, 2009. P. A. McGillivary, Schwehr, K., and Fall, K., “Enhancing AIS to Improve Whale-Ship Collision Avoidance and Maritime Security”, IEEE Oceans. Biloxi, MS, USA, 2009. N. Wijekoon, Parrish, C. E., and Scott, G., “Analysis of Lidar Leaf Penetration Indices for Selected Plant Species in a Coastal Marsh and Correlation with Terrain Elevation Accuracy”, American Society for Photogrammetry and Remote Sensing (ASPRS). Baltimore, MD, USA, 2009. K. Schwehr, Brennan, R. T., Sellars, J., and Smith, S. M., “Discovery of Marine Datasets and Geospatial Metadata Visualization”, American Geophysical Union (AGU). San Francisco, CA, USA, 2009. L. G. Ward, “Development and Analysis of a Bathymetric Database for Great Bay Estuary, New Hampshire”, New Hampshire Department of Environmental Services (DES), New Hampshire Coastal Program (NHCP), 2009. L. Alexander, “e-Navigation: Concept and Reality”, Sea Technology, vol. 50. Compass Publications Inc., Deer Isle, ME, USA, pp. 7-7, 2009. L. C. Huff, Fonseca, L., Hou, T., and McConnaughey, R., “Comparison Between Physical Sediment Samples and Grain-size Estimates from GeoCoder”, International Hydrographic Conference (HYDRO). Cape Town, Western Cape, South Africa, 2009. S. Pe'eri and Rzhanov, Y., “CHARTS data fusion: Multi-sensor imagery co-registration”, Coastal Geotools. Myrtle Beach, SC, USA, pp. 62-63, 2009. M. Jacobi, Braswell, R., Merten, A. A., Kinner, N. E., and Schwehr, K., “Environmental Response Management Application (ERMA) - Web-based GIS Data Display and Management System for Oil Spill Planning and Environmental Response”, Coastal Geotools. Myrtle Beach, SC, USA, 2009. S. Pe'eri, Morrison, J. R., Frederick, S., Mathieson, A., Brook, A., and Trowbridge, P., “Macroalgae and Eelgrass Mapping in Great Bay Estuary Using AISA Hyperspectral Imagery.”, The New Hampshire Estuaries Project, Piscataqua Regional Estuary Program, 2009. K. H. Brink, Beardsley, R. C., Limeburner, R., Irish, J. D., and Caruso, M., “Long-Term Moored Array Measurements of Currents and Hydrography over Georges Bank: 1994-1999”, Progress in Oceanography, vol. 82. Elsevier, New York, NY, USA, pp. 191-223, 2009. I. Gonin, Johnson, G., Shalaev, R., Tetreault, B., and Alexander, L., “USCG Development, Test and Evaluation of AIS Binary Messages for Enhanced VTS Operations”, Institute of Navigation. Anaheim, CA, USA, 2009. C. Monfort and Lippmann, T. C., “Assimilation of Airborne Imagery with LIDAR for Bathymetric Estimation”, FUDOTERAM Workshop Reminder on LiDAR Bathymetric Studies. Montreal, Quebec, Canada, pp. 1-1, 2009. M. S. Boettcher and McGuire, J., “Oceanic Transform Fault Seismicity Earthquakes of a Different Kind”, International Workshop on Statistical Seismology. Lake Tahoe, CA, USA, 2009. T. C. Lippmann, “Daily Surface Currents from Argus Video at Benson Beach, WA”, U.S. Army, U.S. Army Corps of Engineers, 2009. T. C. Weber, Clark, T. J., and Doucet, M., “ME70 Seafloor Characterization and 4D Water Column Visualization”, ICES Working Group on Fisheries Acoustics, Science and Technology. Ancona, Ancona, Italy, 2009. T. C. Lippmann, “Africa Partnership Station”, Department of Defense (DoD), Office of Naval Research (ONR), 2009. C. Ware, “Quantitative Texton Sequences for Legible Bivariate Maps”, IEEE Transactions on Visualization and Computer Graphics, vol. 15. IEEE, Washington DC, Washington DC, USA, pp. 1523-1529, 2009. B. R. Calder and Schwehr, K., “Traffic Analysis for the Calibration of Risk Assessment Models”, U.S. Hydrographic Conference (US HYDRO). Norfolk, VA, USA, 2009. S. Ackerman, Rzhanov, Y., and Barnhardt, W., “Creating GeoTIFF Photomosaics from Seafloor Video”, Coastal Geotools. Myrtle Beach, SC, USA, 2009. L. Alexander, “Precise Naviation and Maneuverin in Ports, Evaluation Report for EFFORTS Project Work Package 1.2”, ISSUS/Hamberg Port Authority, EC Contract No FP6-031486, 2009. H. Calderon and Alexander, L., “Marine Spatial Data Infrastructure (MSDI) Challenges and Opportunities: The Cuban Experience”, GEOMATICA. Havana, Havana, Cuba, 2009. C. Ware, Mitchell, J., Arsenault, R., and Kelley, J. G., “Optimally Displaying 2D Vector Fields of Meteorology and Oceanography”, American Meteorlogical Society. Phoenix, AZ, USA, 2009. R. W. Ward, Alexander, L., and Greenslade, B., “The New IHO Hydrographic Geospatial Standard for Marine Data and Information”, International Hydrographic Review, vol. 5. Geomatics Information & Trading Center - GITC, Lemmers, Amsterdam, The Netherlands, pp. 44-55, 2009. R. E. Grizzle, Malik, M. A., and Ward, L. G., “High-resolution Seafloor Mapping and an Assessment of the Effectiveness of the Western Gulf of Maine Closure Area (WGOMCA)”, Workshop on Integrating Seafloor Mapping and an Assessment of the Effectiveness of the Western Gulf of Maine. Portland, ME, USA, 2009. J. R. Morrison, Pe'eri, S., Trowbridge, P., and Frederick, S., “Using Moored Arrays and Hyperspectral Aerial Imagery to Develop Eelgrass-based Nutrient Criteria for New Hampshire's Great Bay Estuary”, Coastal Geotools. Myrtle Beach, SC, USA, pp. 60-61, 2009. K. Schwehr and Alexander, L., “Right Whale AIS Project (RAP): Acoustic Detections in the Boston Approaches”, Inland Navigation Technology. Vicksburg, MS, USA, 2009. C. E. Parrish and Nowak, R. D., “Improved Approach to LIDAR Airport Obstruction Surveying Using Full-Waveform Data”, Journal of Surveying Engineering, vol. 135. Amercian Society of Civil Engineers , Reston, VA, USA, pp. 72-82, 2009. L. Alexander and Seefeldt, D., “Development of Port ENC Standard”, Smart Rivers '21. Vienna, Vienna, Austria, 2009. M. A. Malik, Weirich, J., Russel, C., Stuart, E., Peters, C., Mayer, L. A., and Armstrong, A. A., “Okeanos Explorer - Aligning Today's Technology to a New Paradigm of Ocean Exploration”, FEMME - Kongsberg (users conference). Lisbon, Lisbon, Portugal, 2009. J. V. Gardner and Malik, M. A., “Physiography of the Eastern Mendocino Ridge, NE Pacific Ocean”, American Geophysical Union (AGU). San Francisco, CA, USA, 2009. T. C. Lippmann, “Assimilation of Airborne Imagery with Lidar for Surf Zone Bathymetric Estimation”, U.S. Army, Joint Airborne Lidar Bathymetry Technical Center of Expertise (JALBTCX), 2009. R. E. Soraruf, “Geomorphologic Inputs for the Determination of Hydrographic Survey Prioritization”, 2009. A. McGarr, Boettcher, M. S., and Fletcher, J. B., “A Deployment of Broadband Seismic Stations in Two Deep Gold Mines”, Rockbursts and Seismicity in Mines. Taylor & Francis, 2009. L. Alexander, “e-Navigation: Challenges and Opportunities.”, Inland Navigation Technology. Vicksburg, MS, USA, 2009. T. C. Lippmann, “The Vertical Structure of Shallow Water Flow in the Surf Zone”, Department of Defense (DoD), Office of Naval Research (ONR), 2009. G. A. Rice and Calder, B. R., “Data Density and Grid Resolution”, U.S. Hydrographic Conference (US HYDRO). Norfolk, VA, USA, 2009. Y. Rzhanov and Pe'eri, S., “Registration of the Hyperspectral Data to Aerial Photography (USACE's CHARTS Systems).”, FUDOTERAM Workshop Reminder on LiDAR Bathymetric Studies. Montreal, Quebec, Canada, 2009. L. Alexander, “Port ECDIS. Evaluation Report for EFFORTS Project Work Package 1.3”, ISSUS/Hamberg Port Authority, EC Contract No FP6-031486, 2009. L. Alexander, “e-Navigation and Electronic Charting: Implications for Hydrographic Community”, U.S. Hydrographic Conference (US HYDRO). Norfolk, VA, USA, 2009. T. C. Lippmann, “Analytic solution for the forced mean cross-shore flow in the surf zone”, International Conference on Coastal Engineering (ICCE). ASCE, Hamburg, Hamburg, Germany, pp. 789-797, 2009. L. Fonseca, Brown, C., Calder, B. R., Mayer, L. A., and Rzhanov, Y., “Angular Range Analysis of Acoustic Themes from Stanton Banks Ireland: A Link Between Visual Interpretation and Multibeam Echosounder Angular Signatures”, ACM Transactions on Applied Perception (TAP), vol. 70. Association for Computing Machinery (ACM), New York, NY, USA, pp. 1298-1304, 2009. L. Fonseca, Rzhanov, Y., McGonigle, C., and Brown, C., “Automatic Construction of Acoustic Themes for Benthic Habitat Mapping at Stanton Banks, UK”, GeoHab. Trondheim, Trondheim, Norway, 2009. D. M. Burdicki, Moore, G., Grizzle, R. E., Ward, K., Mathieson, A., and Pe'eri, S., “Baseline Survey of Habitats and Resources of the North Mill Pond”, New Hampshire Department of Environmental Services (DES), New Hampshire Coastal Program (NHCP), 2009. M. S. Moser, “Bathymetric Uncertainty Model for the L-3 Klein 5410 Sidescan Sonar”, 2009. A. McGarr, Boettcher, M. S., Fletcher, J. B., Sell, R., Johnston, M. J., Durrheim, R., Spottiswoode, S., and Milev, A., “Broadband Records of Earthquakes in Deep Gold Mines and a Comparison with Results from SAFOD, California”, Bulletin of the Seismological Society of America, vol. 99. Seismological Society of America, pp. 2815-2824, 2009. G. Masetti, “Carte nautiche elettroniche dell'I.I.M. e cartografia tecnica regionale: studio di fattibilita per una necessaria integrazione”, Atti 13a Conferenza Nazionale ASITA. Bari, Bari, Italy, pp. 1387-1392, 2009. N. E. Kinner, Lippmann, T. C., Ravens, T., and Zufeldt, J., “Climate Change Impacts and Research Needs for DoD Assets in Alaska's Coastal Regions”, U.S. Army, Cold Regions Research and Engineering Laboratory (CRREL), 2009. J. Felzenberg, “Detecting Bedform Migration from High Resolution Multibeam Bathymetry in Portsmouth Harbor, New Hampshire, USA”, University of New Hampshire, Durham, NH, 2009. G. Masetti and Orsini, F., “Environmental Risks Monitoring of Shipwrecks in Italian Seas”, International Hydrographic Review, vol. 11. International Hydrographic Bureau, Monaco, Monaco Cedex, Monaco, pp. 52-60, 2009. 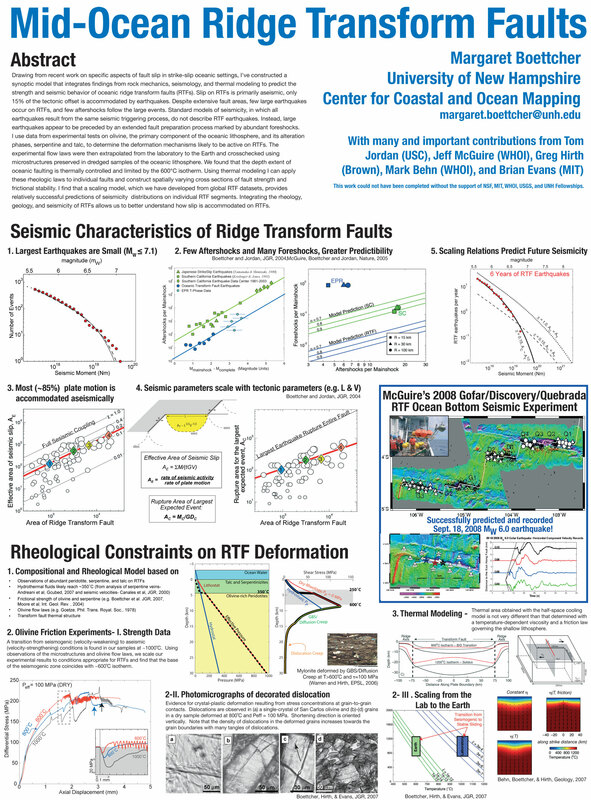 M. S. Boettcher, McGarr, A., and Johnston, M. J., “Extension of Gutenberg-Richter Distribution to Mw -1.3, No Lower Limit in Sight”, Geophysical Research Letters, vol. 36. American Geophysical Union , Washington DC, Washington DC, USA, p. 1-, 2009. M. D. Plumlee, Schwehr, K., Alexander, L., Sullivan, B. M., and Ware, C., “GeoCoastPilot: A Better Way of Organizing and Displaying Information in Support of Port Familiarization”, IEEE Oceans. Biloxi, MS, USA, 2009. D. M. Grebner, Bradley, D. L., Capone, D. E., Parks, S., Miksis-Olds, J., and Ford, J. K. B., “Killer Whale Discrete Pulsed Call Variation”, Journal of the Acoustical Society of America, 2009. D. Perkovic, Lippmann, T. C., and Frasier, S. J., “Longshore Surface Currents Measured by Doppler Radar and Video PIV Techniques”, IEEE Transactions on Geoscience and Remote Sensing, vol. 47(8). IEEE, Washington DC, Washington DC, USA, pp. 2787-2800, 2009. G. Masetti and Orsini, F., “L'Unione Europea contro la pirateria marittima nel Golfo di Aden”, Informazioni della Difesa, vol. 6. Italian Ministero Della Difesa, Rome, Rome, Italy, pp. 10-15, 2009. L. A. Mayer, Armstrong, A. A., and Gardner, J. V., “Mapping in the Arctic Ocean in Support of a Potential Extended Continental Shelf”, U.S. Hydrographic Conference (US HYDRO). Norfolk, VA, USA, pp. 0-13, 2009. M. S. Boettcher, “Mid-Ocean Ridge Transform Faults”. 2009. J. V. Gardner, Malik, M. A., and Walker, S., “Plume 1400 Meters High Discovered at the Seafloor off the Northern California Margin”, EOS Transactions, American Geophysical Union, vol. 90. American Geophysical Union , Washington DC, Washington DC, USA, pp. 275-275, 2009. P. Dartnell and Gardner, J. V., “Seafloor Terrain Analysis and Geomorphology of the Greater Los Angeles Margin and San Pedro Basin, Southern California”, in Earth Science in the Urban Ocean: The Southern California Continental Borderland., no. H.J. Lee & W.R. Normark, The Geological Society of America (GSA), 2009, pp. 9-28. T. C. Lippmann and Smith, G. M., “Shallow Surveying in Hazardous Waters”, U.S. Hydrographic Conference (US HYDRO). THSOA, Norfolk, VA, USA, pp. 1-12, 2009. R. Boyd, Keene, J., Hubble, T., Gardner, J. V., Glenn, K., Ruming, K., and Exon, N., “Southeast Australia: A Cenozoic continental margin dominated by mass transport”, Submarine Mass Movements and Their Consequences. Austin, TX, USA, pp. 491-502, 2009. G. Symonds and Lippmann, T. C., “Surf on Tropical Islands”, in Encyclopedia of Islands, 1st ed., vol. 2, no. R.G. Gillespie & D.A. Clague, Los Angeles, CA, USA: University of California Press, 2009, pp. 879-883. G. Masetti and Orsini, F., “Tutela dell’ambiente marino: Le responsabilità degli Stati costieri nell’individuazione e nel monitoraggio dei relitti marini presenti nelle acque di propria giurisdizione”, Gazzetta Ambiente, vol. 5. Gazzetta Ambiente, Rome, Rome, Italy, pp. 26-31, 2009. J. V. Gardner and Malik, M. A., “U.S. Law of the Sea Cruise to Map the Eastern Mendocino Ridge, Eastern Pacific Ocean”, University of New Hampshire, Durham, NH, 2009. L. A. Mayer and Armstrong, A. A., “U.S. Law of the Sea cruise to map the foot of the slope and 2500-m isobath of the US Arctic Ocean margin, cruise report for 2009”, Center for Coastal and Ocean Mapping (CCOM)/Joint Hydrographic Center (JHC), 2009. J. R. Morrison, Gregory, T. K., Pe'eri, S., McDowell, W., and Trowbridge, P., “Using Moored Arrays and Hyperspectral Aerial Imagery to Develop Nutrient Criteria for New Hampshire's Estuaries”, The New Hampshire Estuaries Project, Piscataqua Regional Estuary Program, 2009. S. Pe'eri and Rzhanov, Y., “Mosaicking Tools for Aerial Imagery from a LIDAR Bathymetry Survey”, International Hydrographic Review, vol. 9. Geomatics Information & Trading Center - GITC, Lemmers, Amsterdam, The Netherlands, pp. 35-44, 2008. L. Alexander, “e-Navigation, ECDIS and MIOs: At Present and in the Future”, eNavigation Conference. Seattle, WA, USA, 2008. S. Pe'eri, Morgan, L. V., and Armstrong, A. A., “Development and Assessment of Airborne LIDAR Bathymetry Products for Shoreline Mapping”, Shallow Water Survey Conference (SWS). Durham, NH, USA, 2008. D. Monahan, Vogt, P. R., and Cormier, M. H., “A Proposal to Complete Mapping of the World Ocean Floors”, American Geophysical Union (AGU). San Francisco, CA, USA, 2008. D. Monahan, “International Research and Law of the Sea, Navigating A Course Toward Ocean Renewable Energy”, American Geophysical Union (AGU). Orlando, FL, USA, 2008. D. Monahan, “The impacts of a non-accepted boundary claim: Russiaâ€™s frontier in the Arctic Ocean”, Association of American Geographers (AAG). Boston, MA, USA, 2008. L. C. Huff, Fonseca, L., Hou, T., and McConnaughey, R., “A Workable Schema for Editing Multibeam Backscatter”, Shallow Water Survey Conference (SWS). Durham, NH, USA, 2008. L. Alexander and Casey, M. J., “Use of Portable Piloting by Maritime Pilots”, Canadian Hydrographic Conference (CHC). Victoria, British Columbia, Canada, pp. 1-9, 2008. M. Jakobsson, Macnab, R., Mayer, L. A., Anderson, R. M., Edwards, M., Hatzky, J., Schenke, H. W., and Johnson, P., “An Improved Bathymetric Portrayal of the Arctic Ocean: Implications for Ocean Modeling and Geological, Geophysical and Oceanographic Analyses”, Geophysical Research Letters, vol. 35. American Geophysical Union , Washington DC, Washington DC, USA, pp. 0-1, 2008. L. Fonseca and Rzhanov, Y., “Automatic Construction of Acoustic Themes from Multibeam Backscatter Data”, Shallow Water Survey Conference (SWS). Durham, NH, USA, 2008. C. E. Parrish, “New Approach to Autoextraction and Attribution of Airport Obstructions from LIDAR Data”, Transportation Research Board (TRB) . Washington DC, Washington DC, USA, 2008. J. Felzenberg, Ward, L. G., Rzhanov, Y., Irish, J. D., and Mayer, L. A., “Detecting bedform migration in Portsmouth Harbor, New Hampshire, USA, on relatively short spatial and temporal scales”, American Geophysical Union (AGU). San Francisco, CA, USA, 2008. L. D. Trusel, Willems, B. A., Powell, R. D., and Mayer, L. A., “Quantification of Glacimarine Sediment Yields Using Multibeam Sonar in Alaskan Fjords”, American Geophysical Union (AGU), vol. 89. San Francisco, CA, USA, 2008. T. C. Weber, “Clustered Scatterers: The Effect on the Mean Acoustic Field”, ACM Transactions on Applied Perception (TAP), vol. 123. Association for Computing Machinery (ACM), New York, NY, USA, pp. 3897-3898, 2008. L. Alexander, “Marine Electronic Chart Highway Project: The MIO Component”, CARIS. Bath, Bath, UK, 2008. R. Wigley, Pe'eri, S., and Ward, L. G., “Analysis of Coastal Morphology for Crescent and Sea Point Beaches, Maine Ground-truth Airborne LIDAR Bathymetry Digital Elevation Models”, Shallow Water Survey Conference (SWS). Durham, NH, USA, 2008. K. Brumley, Mayer, L. A., Miller, E. L., and Coakley, B., “Dredged Rock Samples from the Alpha Ridge, Arctic Ocean: Implications for the Tectonic History and Origin of the Amerasian Basin”, American Geophysical Union (AGU), vol. 89. San Francisco, CA, USA, 2008. C. Ware, “Towards a perceptual theory of flow visualization”, IEEE Computer Graphics and Application, vol. 28. IEEE, Washington DC, Washington DC, USA, pp. 6-11, 2008. L. Fonseca, Robidoux, L., and Watt, G., “A Qualitative Assessment of Two Multibeam Echo Sounder (MBES) Backscatter Analysis Approach”, Canadian Hydrographic Conference (CHC). Victoria, British Columbia, Canada, p. 1, 2008. Y. Rzhanov and Pe'eri, S., “Registration of the hyperspectral data to aerial photography (USACE's CHARTS systems)”, Joint Airborne LIDAR Bathymetry Technical Center of Expertise Coastal Mapping and Charting Workshop (JALBTCX). San Francisco, CA, USA, 2008. V. E. Schmidt, “Arctic Sound Speed: A Desktop Study for Single Beam Echo Sounding”, American Geophysical Union (AGU), vol. 89. San Francisco, CA, USA, 2008. B. R. Calder, Brennan, R. T., Marcus, J., Malzone, C., and Canter, P., “High-precision, High-accuracy Timekeeping in Distributed Survey Systems”, International Hydrographic Review, vol. 9. Geomatics Information & Trading Center - GITC, Lemmers, Amsterdam, The Netherlands, pp. 9-24, 2008. M. Jakobsson and Mayer, L. A., “Glaciogenic Bedforms on the Chukchi Borderland, Morris Jesup Rise and Yermak Plateau: Three Prolongations of the Arctic Ocean Continental Margin”, American Geophysical Union (AGU). San Francisco, CA, USA, 2008. C. Ware and Gilman, A. T., “Visual Thinking with Interactive Diagram”, Lecture Notes on Artificial Intelligence, vol. 5223. Springer Publisher, New York, NY, USA, pp. 118-126, 2008. L. Alexander, “e-Navigation, ECDIS and PPUs: Challenges and Opportunities”, IMPA Congress. Bangkok, Bangkok, Thailand, 2008. K. Schwehr, Andres, P., Craig, J., Deen, R., De Jong, E., Fortino, N., Gorjian, Z., Kuramura, K., Lemmon, M., Levoe, S., Leung, C., Lutz, N., Ollerenshaw, R., Smith, P., Stetson, M., Suzuki, S., and the Phoenix Science Team, “Visualizing the Operations of the Phoenix Mars Lander”, American Geophysical Union (AGU). San Francisco, CA, USA, 2008. J. Felzenberg, Ward, L. G., Rzhanov, Y., and Mayer, L. A., “Detecting bedform migration in Portsmouth Harbor on relatively short time-scales from high-resolution multibeam bathymetry”, Shallow Water Survey Conference (SWS). Durham, NH, USA, 2008. C. E. Parrish, Sellars, J., White, S. A., Bachmann, C. M., Montes, M. J., and Fusina, R. A., “Shoreline Mapping with Lidar and HSI-Derived Bathymetry”, GeoTech. Silver Springs, MD, USA, 2008. L. Alexander, “Use of Portable Piloting Units (PPUs) by Maritime Pilots: Study Findings and Implications”, American Pilot's Association Biennial Convention. Kauai, HI, USA, 2008. T. C. Weber, Weirathmueller, M., and Mayer, L. A., “High-frequency One-way Propagation Experiments in Portsmouth Harbor, NH”, Meeting of the Acoustical Society of America (ASA). Miami, FL, USA, 2008. R. Braswell, Schwehr, K., Milliman, T., and Fisk, J., “Open Geoscience: Using Free and Open Source Software for Research and Education”, American Geophysical Union (AGU). Orlando, FL, USA, 2008. C. Ware, “Why Do We Keep Turning Time into Space?”, in Understanding Dynamics of Geographic Domains, Boca Raton, FL, USA: CRC Press, LLC, 2008, pp. 3-12. S. Gallager, York, A., Howland, J., Taylor, R., Vine, N., Prasad, L., Swaminagayan, S., Mayer, L. A., Rzhanov, Y., Rosencranz, G., Hart, D., and Rago, P., “Development of Advanced Technologies for Surveying Sea Scallops and Other Benthic Organisms”, Joint Airborne LIDAR Bathymetry Technical Center of Expertise Coastal Mapping and Charting Workshop (JALBTCX). San Francisco, CA, USA, 2008. K. Schwehr, “Google's Spatial Tools in the Marine Environment - Decision Support”, Google Tech Talk. San Francisco, CA, USA, 2008. L. Alexander and Casey, M. J., “The Use of Portable Piloting Units”, Digital Ship, vol. 8. Digital Ship Ltd., London, London, UK, pp. 54-55, 2008. L. Alexander, “Portable Piloting Units (PPUs): Current Use, Future Trends”, The Radio Technical Commission for Maritime Services (RTCM). San Diego, CA, USA, 2008. W. Uddin and Parrish, C. E., “Lidar Obstruction Surveys and Imagery Data for Airport Applications”, International Conference on Transport Infrastructure (ICTI). Beijing, Beijing, China, 2008. S. Pe'eri, Morgan, L. V., and Armstrong, A. A., “Airborne Lidar Bathymetry Products for Shoreline Mapping”, Joint Airborne LIDAR Bathymetry Technical Center of Expertise Coastal Mapping and Charting Workshop (JALBTCX). San Francisco, CA, USA, 2008. C. Ware, Visual Thinking for Design. Boca Raton, FL, USA: CRC Press, LLC, 2008. D. Monahan, “Application of the General Bathymetric Chart of the Oceans (GEBCO) Digital Atlas in the Delineation of Continental Shelves Under Article 76”, Journal of Ocean Technology, vol. 3. Journal of Ocean Technology (JOT), pp. 24-29, 2008. S. Pe'eri, Gardner, J. V., and Ward, L. G., “Validating coastal flooding models using ALB-derived shorelines”, Canadian Hydrographic Conference (CHC). Victoria, British Columbia, Canada, 2008. M. Jacobi, Kinner, N. E., Braswell, R., Schwehr, K., Newman, K. S., and Merten, A. A., “Environmental Response Management Application”, International Oil Spill Conference (IOSP). Savannah, GA, USA, 2008. A. Trembanis, Hiller, T., Fonseca, L., and Mayer, L. A., “Going Autonomous Seafloor Mapping from an AUV, Recent Results and Challenges”, Shallow Water Survey Conference (SWS). Durham, NH, USA, 2008. J. R. Morrison, Trowbridge, P., Pe'eri, S., Gregory, T. K., and Novak, M., “Hyperspectral airborne remote sensing for assessing water quality and clarity in the Great Bay Estuary of New Hampshire”, Ocean Sciences Meeting. Orlando, FL, USA, 2008. L. Alexander, “MIOs: The What, Why, and How: Seaways”, ACM Computing Surveys. Association for Computing Machinery (ACM), New York, NY, USA, pp. 13-15, 2008. 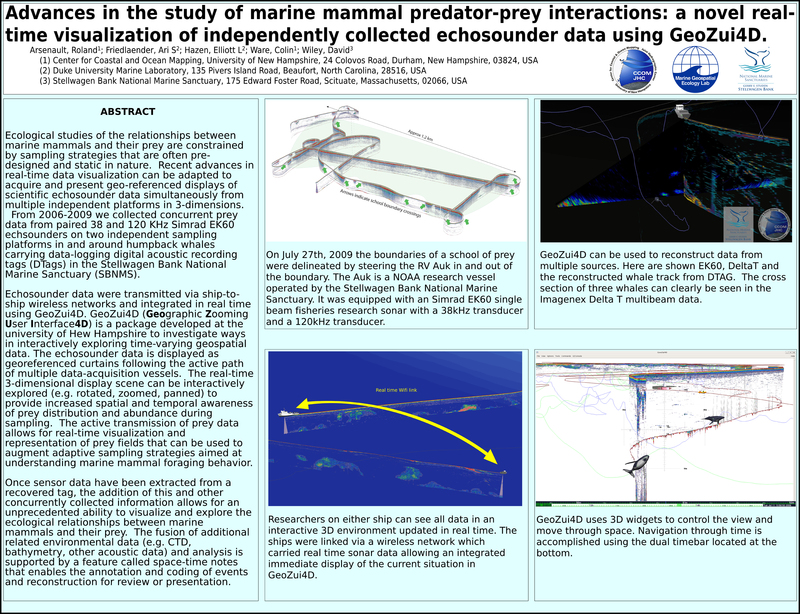 M. A. Malik, Mayer, L. A., Fonseca, L., Ward, L. G., Huff, L. C., and Calder, B. R., “Approaches and Requirements of Quantitative Comparison of the Multibeam Sonar Benthic Acoustic Backscatter”, Shallow Water Survey Conference (SWS). Durham, NH, USA, 2008. C. E. Parrish, “Improved Lidar Shoreline Mapping Using Spectrally-Derived Shallow-Water Bathymetry”, Joint Airborne LIDAR Bathymetry Technical Center of Expertise Coastal Mapping and Charting Workshop (JALBTCX). San Francisco, CA, USA, 2008. M. Weirathmueller, Weber, T. C., and Mayer, L. A., “Observations of High Frequency, Long Range Acoustic Propagation in a Harbor Environment”, WaterSide Security. Copenhagen, Copenhagen, Denmark, 2008. T. C. Weber, “Clustered Scatters: The Effect on the Mean Acoustic Field”, Meeting of the Acoustical Society of America (ASA). Paris, Paris, France, 2008. S. Pe'eri, Gardner, J. V., Morrison, J. R., and Ward, L. G., “Ground-truth Results of Comparison or Airborne LIDAR Bathymetry in Subtidal Coastal Environments”, American Geophysical Union (AGU), vol. 89. San Francisco, CA, USA, 2008. A. T. Gilman and Ware, C., “Crossmodal binding in working memory”, Cognititve Science Society (CSS). Austin, TX, USA, pp. 201-201, 2008. M. S. Boettcher, “The Natural Earthquake Laboratory in South Africa Gold Mines Project”, Rapid Response Drilling Workshop. Tokyo, Tokyo, Japan, 2008. M. Weirathmueller, “Acoustic Ranging in a Dynamic, Multipath Environment”, 2008. L. Hatch, Clark, C., Merrick, R., Van Parijs, S., Ponirakis, D., Schwehr, K., Thompson, M. A., and Wiley, D. N., “Characterizing the Relative Contributions of Large Vessels to Total Ocean Noise Fields: A Case Study Using the Gerry E. Studds Stellwagen Bank National Marine Sanctuary”, Environmental Management, vol. 42. Springer Publisher, New York, NY, USA, pp. 735-752, 2008. S. S. Rumrill, “Concurrent Assessment of Eelgrass Beds (Zostera narina) and Salt Marsh Communities Along the Estuarine Gradient of the South Slough, Oregon”, Journal of Coastal Research, vol. SI 55. pp. 121-134, 2008. J. V. Gardner, Mayer, L. A., and Armstrong, A. A., “From the Arctic to the Tropics: The U.S. UNCLOS Bathymetric Mapping Program”, Canadian Hydrographic Conference (CHC). Victoria, British Columbia, Canada, pp. 1-11, 2008. 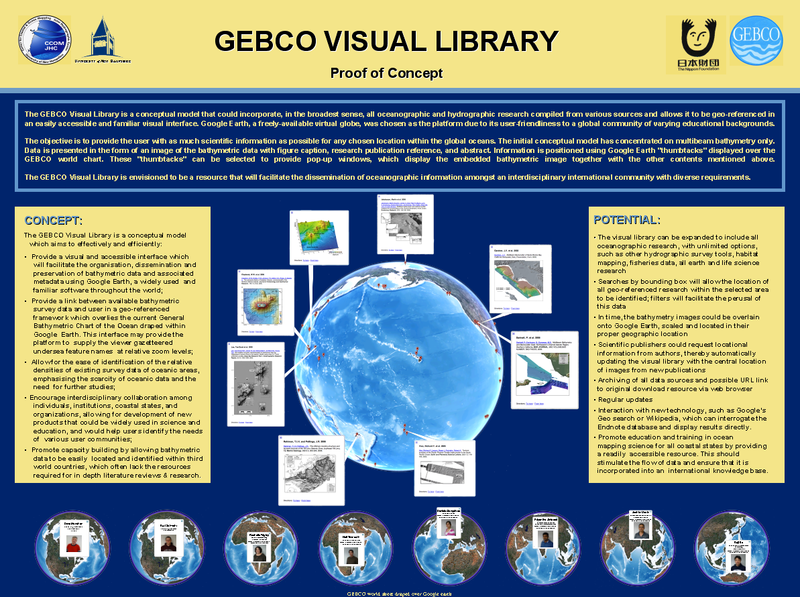 D. Monahan, Schwehr, K., Wigley, R., Uddin, M. J., Tinmouth, N., Jinadasa, P., Ito, K., and Goncalves, D., “GEBCO Visual Library, Proof of Concept”, International Bathymetric Science Day. Tokyo, Tokyo, Japan, pp. 1-1, 2008. K. Schwehr, Plumlee, M. D., Sullivan, B. M., and Ware, C., “GeoCoastPilot - Linking the Coast Pilot with Geo-referenced Imagery & Chart Information”, Shallow Water Survey Conference (SWS). Durham, NH, USA, 2008. E. Sweeney, “Geological Interpretations of a Low-backscatter Anomaly Found in 12-kHz Multibeam Data on the New Jersey Continental Margin”, University of New Hampshire, Durham, NH, 2008. J. R. Morrison, Trowbridge, P., Pe'eri, S., Gregory, T. K., and Novak, M., “Hyperspectral Airborne Remost Sensing for Assesing Water Quality and Clarity in the Great Bay Estuary of New Hampshire”, Ocean Sciences Meeting. Orlando, FL, USA, 2008. R. W. Ward, Alexander, L., Greenslade, B., and Pharaoh, A., “IHO S-100: The New Hydrographic Geospatial Standard for Marine Data and Information”, Canadian Hydrographic Conference (CHC). Victoria, British Columbia, Canada, pp. 1-18, 2008. D. Perkovic, Frasier, S., and Lippmann, T., “Marine Doppler radar surface current measurements in the surf zone”, 9th Current Measurement Technical Conference, vol. 1. IEEE/OES/CMTC, Charleston, SC, pp. 194-202, 2008. C. de Moustier, Kraft, B. J., and McGillicuddy, G., “Multibeam Sonar Calibration Techniques”, Meeting of the Acoustical Society of America (ASA). Paris, Paris, France, 2008. D. Pineo and Ware, C., “Neural Modeling of Flow Rendering Effectiveness”, Symposium on Applied Perception in Graphics and Visualization. Los Angeles, CA, USA, pp. 171-178, 2008. T. C. Weber, “Observations of clustering inside oceanic bubble clouds and the effect on short-range acoustic propagation”, Journal of the Acoustical Society of America, vol. 124. Acoustical Society of America, Melville, NY, USA, pp. 2783-2792, 2008. L. Alexander and McLean, C., “Production of Marine Information Overlays (MIOs) for Marine Environmental Protectoin”, Global Ecology and Oceanography of Harmful Algal Blooms. Sitka, AK, USA, pp. 1-18, 2008. L. A. Mayer, “Recent Mapping and Sampling on the Chukchi Borderland and Alpha/Medeleev Ridge”, American Geophysical Union. San Francisco, CA, United States, 2008. L. A. Mayer, Brumley, K., Andronikov, A., Chayes, D. N., Armstrong, A. A., Calder, B. R., Hall, J. K., Clyde, W. C., Bothner, W. A., and Gardner, J. V., “Recent Mapping and Sampling on the Chukchi Borderland and Alpha/Medeleev Ridge”, American Geophysical Union (AGU), vol. 89. San Francisco, CA, USA, 2008. K. Schwehr, “Seismic-py: Reading Seismic Data with Python”, The Python Papers, vol. 3. The Python Papers, pp. 0-8, 2008. T. C. Lippmann and Smith, G. M., “Shallow Surveying in Hazardous Water”, 5th International Conference High Resolution Surveys in Shallow Water. Durham, NH, USA, p. Portsmouth, NH, 2008. L. G. Ward, Zaprowski, B. J., Trainer, K. D., and Davis, P. T., “Stratigraphy, Pollen History and Geochronology of Tidal Marshes in a Gulf of Maine Estuarine System: Climatic and Relative Sea Level Impacts”, Marine Geology, vol. 256. Elsevier, New York, NY, USA, pp. 1-17, 2008. B. R. Calder, “Uncertainty Representation in Hydrographic Surveys and Products”, Shallow Water Survey Conference (SWS). Durham, NH, USA, 2008. L. A. Mayer and Armstrong, A. A., “U.S. Law of the Sea Cruise to Map the Foot of the Slope and 2500-m Isobath of the U.S. Arctic Ocean Margin. Cruise Report for 2008”, University of New Hampshire (UNH), Center for Coastal and Ocean Mapping (CCOM)/Joint Hydrographic Center (JHC), 2008. B. R. Calder and Gardner, J. V., “U.S. Law of the Sea Cruise to Map the Foot of the Slope of the Northeast U.S. Atlantic Continental Margin: Leg 6”, University of New Hampshire (UNH), Center for Coastal and Ocean Mapping (CCOM)/Joint Hydrographic Center (JHC), 2008. A. A. Armstrong, Calder, B. R., Fonseca, L., Gardner, J. V., and Mayer, L. A., “US UNCLOS Multibeam Data: The Processing of Multibeam Bathymetry and Backcatter”, Hydro International, vol. 8. Geomatics Information & Trading Center - GITC, Lemmers, Amsterdam, The Netherlands, pp. 14-17, 2008. L. Alexander, “Use of Portable Piloting Units by Maritime Pilots”, Canadian Maritime Pilots Association. Vancouver, British Columbia, Canada, pp. 1-9, 2008. S. Pe'eri, Gardner, J. V., and Ward, L. G., “Validating coastal flooding models using ALB-derived shorelines”, Canadian Hydrographic Conference. 2008. C. M. Bachmann, Montes, M. J., Fusina, R. A., Parrish, C. E., Sellars, J., Weidemann, A., Goode, W., Hill, V., Zimmerman, R., Nichols, C. R., Woodward, P., McIlhany, K., Korwan, D., Crawford, M., Monty, J., Truitt, B., and Schwarzschild, A., “Very Shallow Water Bathymetry Retrieval from Hyperspectral Imagery at the Virginia Coast Reserve (VCR’07) Multi-Sensor Campaign”, IEEE International Geoscience and Remote Sensing Symposium (IGARSS). Boston, MA, USA, 2008. P. Mitchell and Ware, C., “Visualizing Graphs in Three Dimensions”, ACM Transactions on Applied Perception (TAP), vol. 5. Association for Computing Machinery (ACM), New York, NY, USA, pp. 1-15, 2008. S. Pe'eri, Morgan, L. V., Philpot, W. D., and Guenther, G., “Lidar as a Shoreline Mapping Tool”, U.S. Hydrographic Conference (US HYDRO). Norfolk, VA, USA, 2007. T. C. Weber, Lyons, A. P., and Bradley, D. L., “Acoustic Propagation in Bubble Clouds Exhibiting Spatial Structure in the Fluctuating Number Density”, IEEE Journal of Oceanic Engineering, vol. 32. IEEE, Washington DC, Washington DC, USA, pp. 513-523, 2007.